Join us in the heart of our award-winning kitchen and learn how to make Charcuterie from Canada’s top chefs. Featuring delicious meats from local supplier Meuwly’s and cheese from Old School Cheesery, guests will be broken into teams of 4 and be hands on as they are walked through all the basics of creating a perfect board. A selection of local beer and Canadian wines will round out this perfect evening of learning, tasting and wonderful company. If you have any questions or dietary restrictions, please contact Annia Motes at sccsales@edmonton.com. THIS EVENT IS NOW SOLD OUT. Please see our second edition July 21. 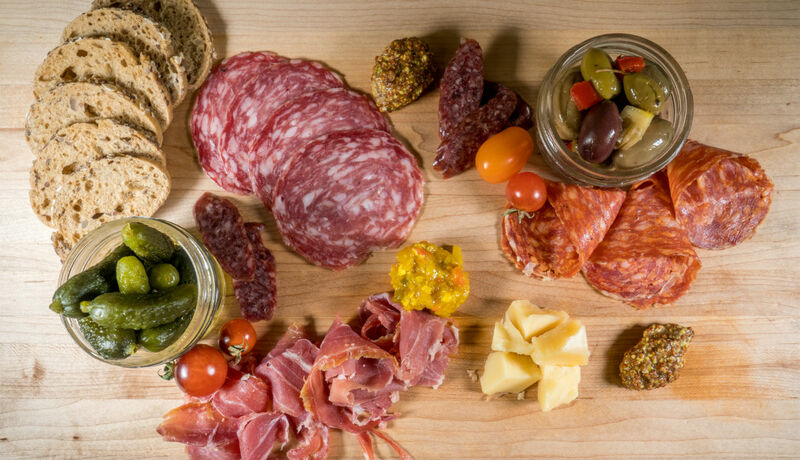 5:30 p.m. – 6:30 p.m. – Charcuterie board class taught by Chef Myles and Executive Chef Serge Belair. Chef Peter Keith will also be available to talk about each of the mouth-watering meats from Meuwly’s. 6:30 p.m. – 7:00 p.m. – Enjoy your hard work and try everything on your board!